I do post the comparisons because there are SOOOO many women who recently BC-ed and tell me how much the comparisons and videos keep them motivated to stay natural or continue transitioning. I agree... I love to look at fotki's and Hair board albums of women who have documented the journey for over a year's time. I personally just enjoy keeping my HJ documented. I don't think I would have BC-ed if I had not seen Maria G's fotki which documents her journey from the BC until now, about 3 years later. Her fotki was my favorite, among plenty of others. I also enjoy Sera's fotki too, her hip length hair is beautiful and to think she started off with a fade !!! Beautiful type 4 hair. Just Kidding ! Here is another comparison... This is a 1 year ( well more like 11 months, 3 weeks lol) comparison of my chunky 2 strand twists done on wet hair. 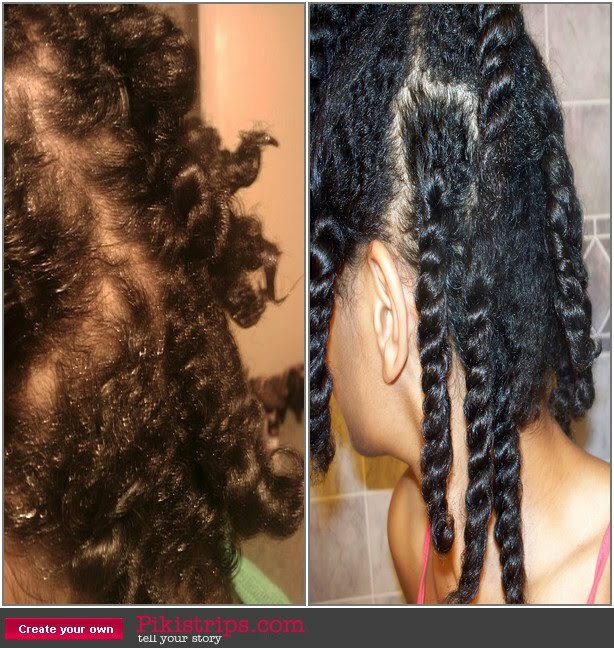 In August 09 after the BC, I could wrap my twists around about 3 to 5 times max. Now I have twists that hang !!! WOOOO HOOOOOO !! I know wigs and weaves aren't for everyone, but have you ever worn them or braids? Maybe micros or a cute crochet style could help you pass time so that you don't have to do a full ceaser ? I used to wear extensions every Spring when I was in college. I was in a college dance company; with my practice schedule it was the easiest thing to do. (I can actually do my own braids.) Since I don't want to pay for someone to do it, I'd have to braid them myself. We'll see. I'll either keep rod setting my hair or braid it unti I'm happy with the length. WOW!! look at that growth!! Please continue to post the comparison pics because I love to see them. The pics are inspirational and I can't wait to reach my 1 year mark. Heck I may just do a 1 month natural hair update. LOL! I love this comparison pics. Its only been 8 months since my big chop and watching your videos and reading the blog has definitely kept me going. I know growth can happen with my texture of hair. Keep being you! You're so right... comparison pics do motivate the rest of us. I just did the BC and it's tough right now but I'm glad to know there are other naturals who pass through that first year with flying colors. Congrats!